Boston Pride Week may only come once a year, but our friends and allies keep working for the LGBT community all year long. 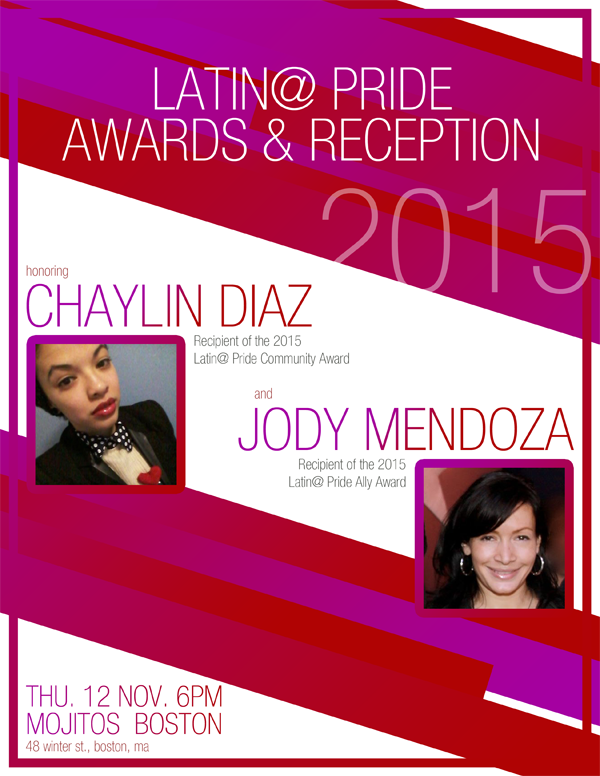 Join Boston Pride as we celebrate two such leaders, Chaylin Diaz and Jody Mendoza, at the annual [email protected] Pride Awards & Reception! Our communities of color rank among the most vibrant and resilient in Boston, so let’s come together to recognize their positive impact on each and every one of us. The reception starts on Thursday, November 12 at 6:00 PM at Mojitos, located at 48 Winter Street in downtown Boston. Chaylin Diaz is a 27 year old Hispanic Florida native and the co-founder and Vice President of Young Voices Silent Cries, a non-profit organization dedicated to handing urban youth the tools they need to succeed. Once discovering that spoken word could be used as a tool to teach youth 21st-century skills such as public speaking, and positive ways to express their emotions, Diaz set out to do just that. She has taught spoken word at various youth organization throughout Boston and was awarded class of the year for Citizen School at the Edwards Middle School in 2013. Diaz believes that art can save our youth and this world. Through her non-profit Diaz has been able to combine lessons of self-love, self-respect and self-awareness with community engagement and societal awareness. Her youth have put together a women empowerment project called “I Am Woman”, a summer community engagement project called “Change 4 Peace, a clothing and food drive called “Threads 4 Life” and are in process of creating a documentary about street harassment on teenagers and women. Diaz stands firmly behind the idea that the most powerful thing that we have accepted is that we need nothing more than our determination and the strength behind our voices to create change. 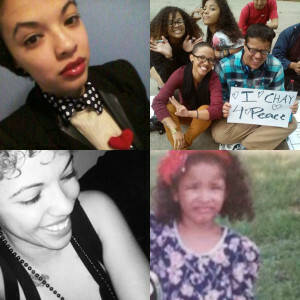 These four images of Chaylin depict her style and essence. Being among her students is where she is most at peace. For all those who think they could never be honored for anything, Chaylin is shown as a child, determined to make a difference. 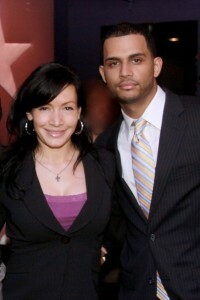 Jody Mendoza is the owner of Mojitos Latin Lounge and Nightclub in downtown Boston. Mojitos opened its doors in August of 2005 and the positive reaction it received was overwhelming and enduring. Mojitos has become a fixture on the nightlife scene and won numerous awards. Mojitos is only one of Jody’s projects. For over ten years she has been organizing and executing events in Boston. She was the General Manager and marketing mind behind the now legendary Sophia’s, a four level nightclub, the first Latin club in Boston. In 2002, she founded Avivé Productions, a Marketing and Promotions company that services the needs of the Boston area Latino community. The events organized by Avivé Productions under her guidance include countless concerts, product launches and promotions, harbor cruises, community events and nightclub promotions. In 2008, Jody co-founded the Boston Music Conference (BMC), an annual event that draws people from around the country to network and learn about the music industry. The BMC brings together aspiring talent, music industry executives, corporations and celebrities every fall in Boston. Jody also serves on the Board of Directors for Roca, a non-profit organization that helps troubled youths, based out of Chelsea, MA. Jody has a history of giving back to the community and was recognized by Mayor Menino for her charity work and fundraising efforts following 9-11 at Sophia’s. Jody resides in Boston and is a member of the National Society of Hispanic MBAs and the Latino Professional Network. Jody’s undergraduate degree was a Bachelor of Arts in Psychology and she received a Masters in Business Administration with a concentration in Marketing from Boston College in 2006.